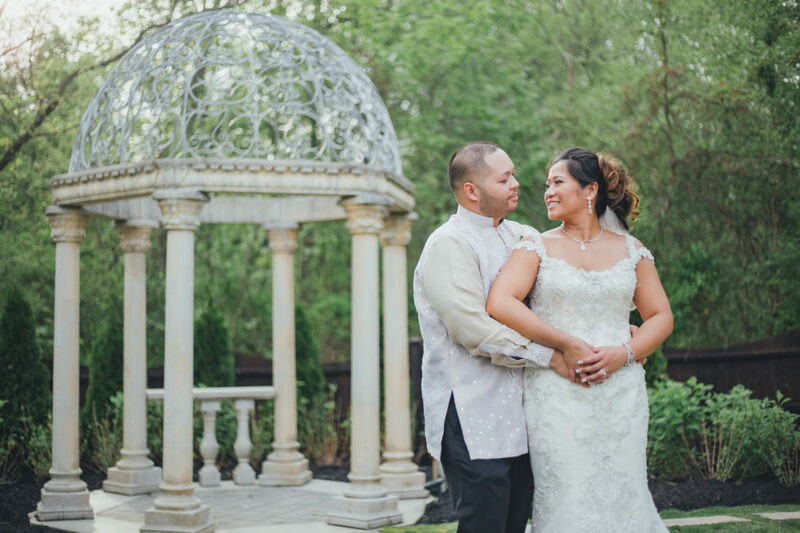 Over our two decades of celebrating weddings with our clients and community, we at Imperial Event Venue have had the privilege of hosting hundreds of Asian weddings, and this has afforded us the ability to see many customs and traditions that we normally wouldn’t have the opportunity of seeing. Although we use the umbrella term “Asian weddings”, we realize that every culture has its own distinct way of celebrating. 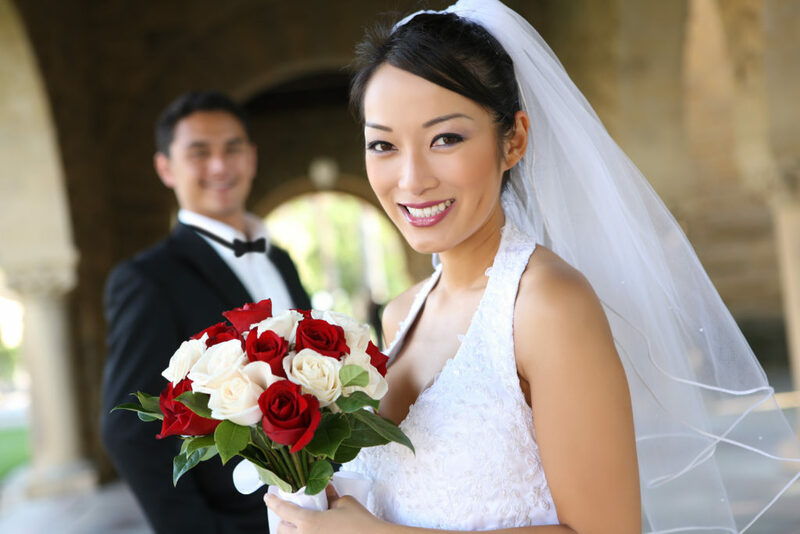 Most consistently, we’ve hosted Chinese weddings, Japanese weddings, Thai weddings, Filipino weddings. And to celebrate the unique differences of each culture, we want to give a breakdown of some of the most common customs, traditions, and itineraries that we’ve seen at the weddings we’ve hosted. With so much rich culture, Chinese weddings are a joy for us to help our clients celebrate. Everything from the ceremony to the food to the dress has us head over heels. 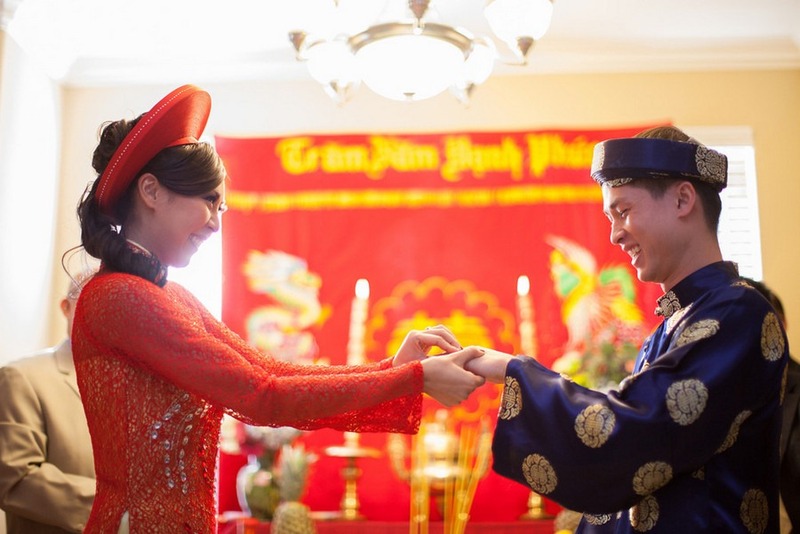 Let’s begin with the traditional red Chinese wedding dress, better known as the qípáo. This dress is often worn for only part of the day, as the bride may choose to slip into something different at the reception. The detail that goes into the qípáo is incredible. From gorgeous gold embroidery running through the dress to the dazzling color, it’s one of our favorite elements of a Chinese wedding. Food is a big part of any culture. It brings people together in times of both sadness and in times of celebration. And at a Chinese wedding, the amount of food is startling. No one will go home hungry! When it comes to catering our Chinese weddings, the menu depends on the couple and their budget—but we most commonly serve a 10-course meal. The three mainstays are suckling pig, chicken, and fish. The seven other dishes may change from couple to couple, but our in-house catering service is consistently asked to make these three main dishes. There are a few variations of the exact symbolism of the suckling pig, but what it’s mainly known to represent is fertility of the bride. The marriage is not said to be complete until it bears fruit, meaning, having children. The chicken (or sometimes another type of poultry) represents peace and unity between the couple. The fish symbolizes abundance. There is a saying that roughly translates to “May your offspring be as plentiful as the fish in the sea.” Meaning, get to having some kids already! 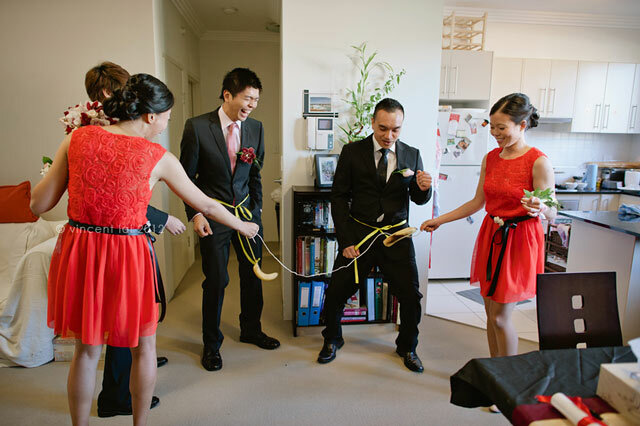 Oftentimes before the ceremony and the reception of a Chinese wedding, there are certain games to symbolize the groom’s love for the bride. These are known as “door games”, and although they sometimes differ, the general theme is the same. One of the games played is locking the groom and groomsmen out of the bride’s home and not allowing them to enter. They may only enter once a fee has been paid. This is to prove the groom’s love for his bride. Armenian weddings have a similar custom, only they play this game before the wedding party leaves the bride’s home. 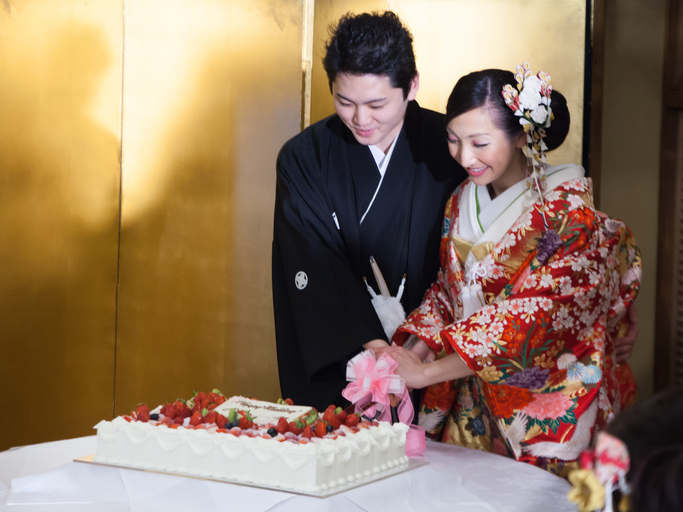 Now let’s take a look at Japanese weddings and their common traditions and customs. There’s a rich history here that has brought forth some very interesting traditions that are still celebrated today. Just as other cultures have pre-wedding meetings with the parents, Japanese tradition is no different. Yui-no is a pre-wedding ritual that involves the parents of the bride and groom meeting, as well as exchanging gifts. Commonly the bride is gifted an obi, which is a sash for her kimono, while the groom is gifted a hakama—loose pants that are part of a formal Japanese dress for the man. These represent virtue and fidelity, respectively. This next tradition is similar to the traditional tea ceremony seen in Chinese culture. 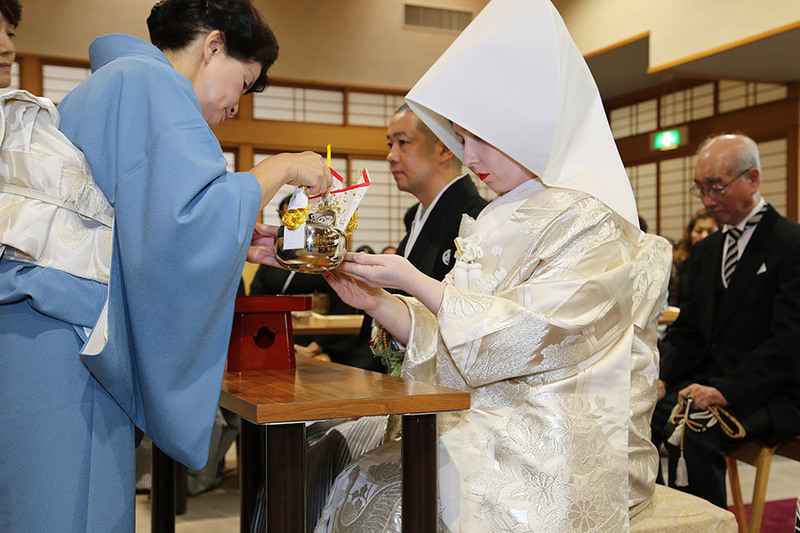 San San Kudo is a Japanese wedding tradition in which the bride and groom sip sake together. The sake ceremony is concluded after nine sips. San San Kudo literally translates to “three, three, nine times”, thus the nine sips out of the traditional sake cups known as sakazuiki. If you’ve ever been to a Japanese wedding, you’ll know to expect plenty of stunning outfit changes from the bride and groom. It all depends on how traditional they want to be, but many couples do incorporate multiple outfit changes. The groom will traditionally wear a black kimono called a montsuki. He will then typically switch into a tuxedo, which may often be blue or white. When it comes to the bride, if she is very traditional, she may make up to five wardrobe changes! Traditionally, you’ll see her switch from a white kimono to a red kimono at the beginning of the reception. Later on in the reception, it’s common for the bride to switch into a western-style wedding dress. The array of colors and designs that you see in Japanese wedding outfits is absolutely breathtaking. Intricate embroidery and floral designs make these some of the most beautiful wedding outfits in the world. After the ceremony, the bride and groom and their guests will usually head to a banquet hall for the reception. Here you’ll find tables full of food for everyone to feast on. One of the most popular dishes that we see (and love!) 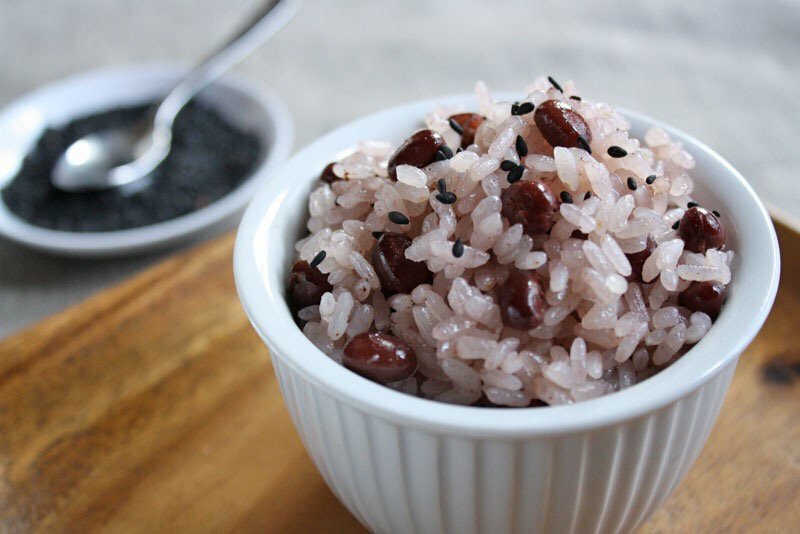 is sekihan, which is made of Japanese azuki beans and sticky rice. The dish is red in color, and symbolizes happiness and celebration. Another delicious dish often served at Japanese weddings is kazunoko, a herring roe which has been marinated in soy sauce. 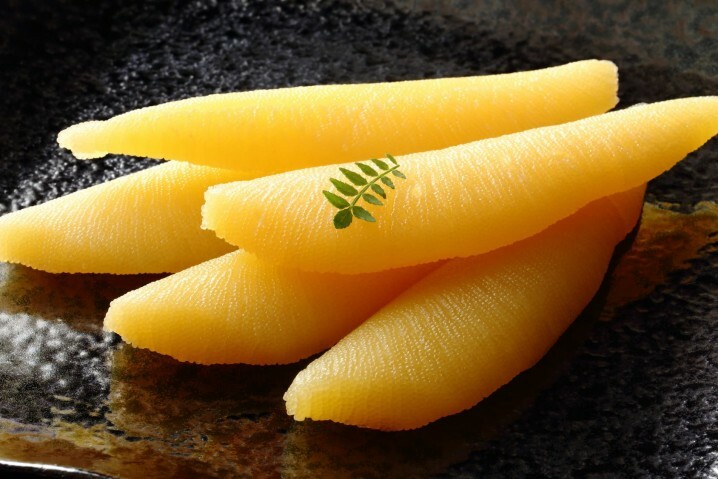 This delicacy is a symbol of fertility. It is often served around New Years as well, as it symbolizes many children and a prosperous family. Perhaps our favorite Japanese wedding dish is datemaki. It’s made from eggs and hanpen (a fish cake). They are cooked in the oven, rolled, and cut into small pieces. An absolute treat! Let’s continue on with Thai weddings, which are filled with rich traditions including auspicious dates, a dowry, and much more. Like some other Asian wedding traditions, it’s very important for Thai weddings to be held on auspicious dates. Auspicious dates are a favorable day in which the Thai culture believes important events should be held on. The family may consult with a monk with knowledge of astrology to decide on what that specific date should be. Despite the thought in today’s culture that a dowry might be insulting, this was common practice in many countries a few hundred years ago as a transaction—and today, many cultures still hang onto the dowry as a tradition and a show of appreciation. 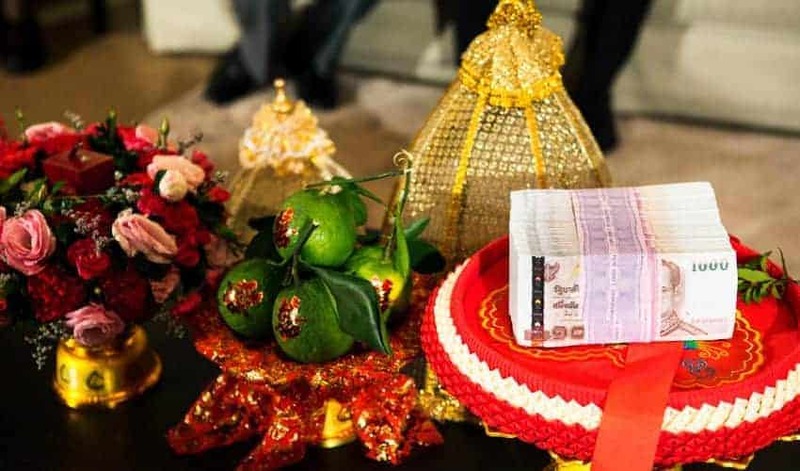 At Thai weddings, there is often a sin sod, which is where the groom presents a tray of money and gifts to the bride’s parents as an offering for their daughter’s hand in marriage. The gifts are then wrapped in silk, and the bride’s mother will often carry the heavy package around to make a show of how much the groom loves his daughter. This is one of our favorite traditions during Thai weddings. This heartfelt portion of the wedding asks the bride and groom to kneel next to each other while their arms and hands rest on a padded table in front of them. One of the older members of the family will then place what is called the Mong Kol over the bride and groom’s head. 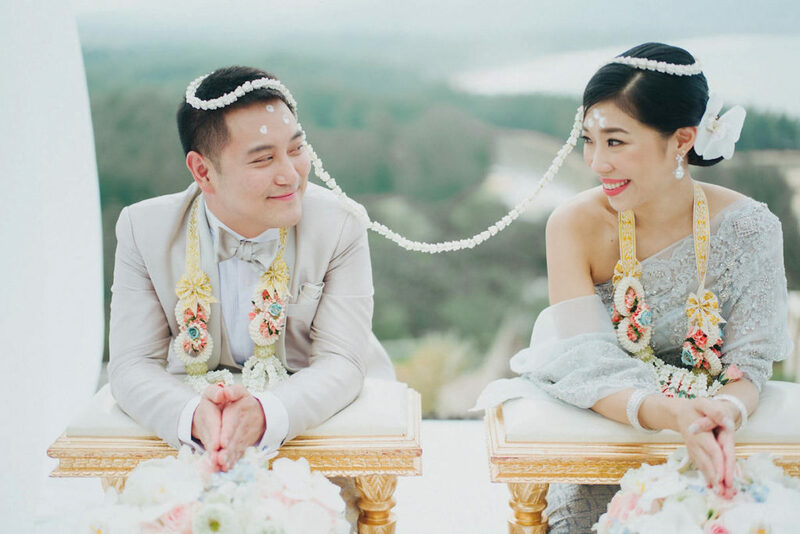 The Mong Kol is a stringed headpiece that ties the two of them together, cementing their union. After the couple has been united with the Mong Kol, you’ll often see another touching ceremony called Rod Nam Sang. This ceremony requires the guests to use a seashell to pour water over the hands of the newly-united couple. While each guest is pouring water, they will usually offer the newlywed couple their best wishes as well as advice on their new life together. Perhaps one of the more westernized weddings that we’ve hosted are Filipino weddings. There are still plenty of traditional elements that these celebrations incorporate that we’ll explore, but comparatively their weddings have adapted more to traditional western style. With over 80% of the Filipino population being Catholic, some of the wedding traditions come from the religion. One typical element that we see in Filipino weddings is holding mass sometime before the ceremony begins. After the mass, we often see a number of traditional ceremonies held where family members and relatives partake in blessing the bride and groom. These relatives are known as “sponsors” of the wedding. To bless the bride, a coin sponsor will offer exactly 13 coins (arras) to the groom, who will then gift it to the bride. This is a sign of his promise to take care of her and the family in the future. However, modern couples will make the promise to each other showing mutual support. To show that the couple are bonded as one, a veil sponsor will drape a white veil over the head of the bride, and over the shoulder of the groom. This ceremony represents their unity together, as well as a wish for health and protection on their journey though life as husband and wife. After the veil ceremony, the cord sponsors will take a knotted cord in the shape of the infinity symbol, known as a yugal, and place it on top of the veil on both the bride and groom. Similar to the veil, the yugal represents that they are no longer two separate individuals, but are now united as one. As a final symbol of their new lives together, a candle ceremony is held. Two smaller outer candles surround a larger candle in the middle. The two smaller candles represent the bride and groom’s separate lives, while the large candle represents their new life together. 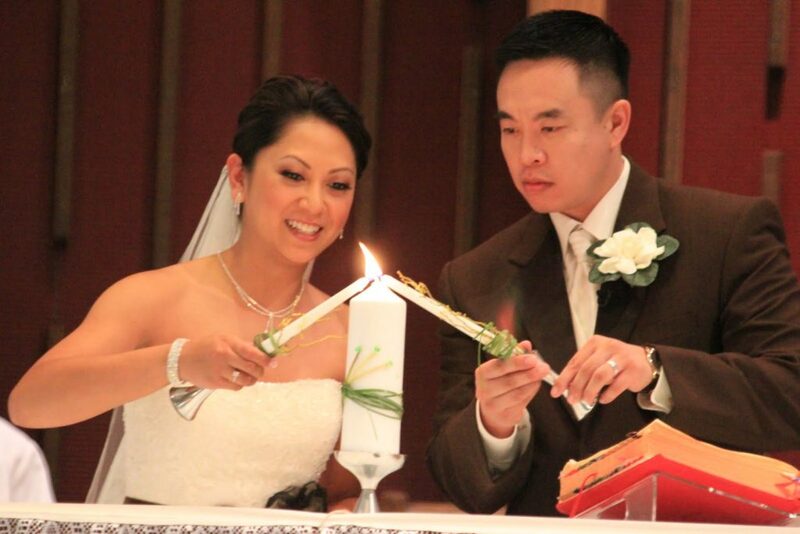 The bride and groom light the center candle together and then blow out the single candles, symbolizing their new future and extinguishing their separate pasts. As mentioned earlier, many Filipino weddings are becoming more and more westernized. However, those who still hold onto some tradition may wear some cultural outfits for the wedding. 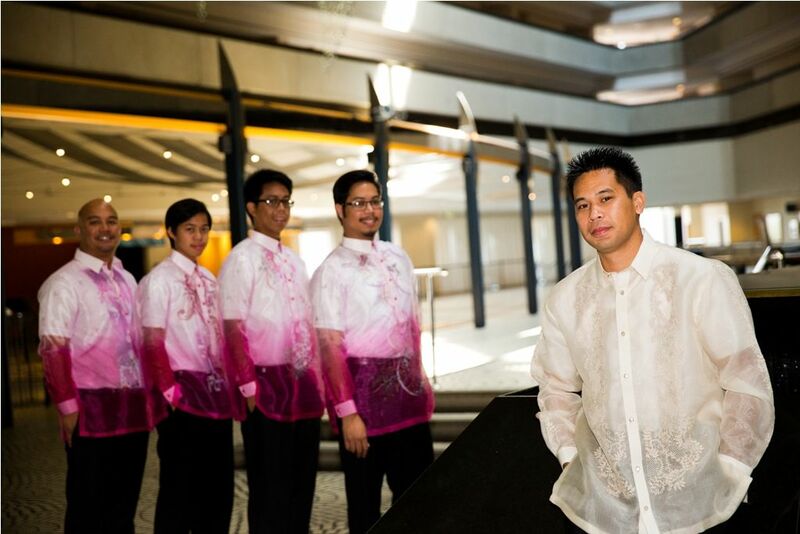 The traditional groom’s attire is the barong, a lightweight shirt made of fine fabric with embroidery along the front and around the collar. This is typically worn untucked and over an undershirt. 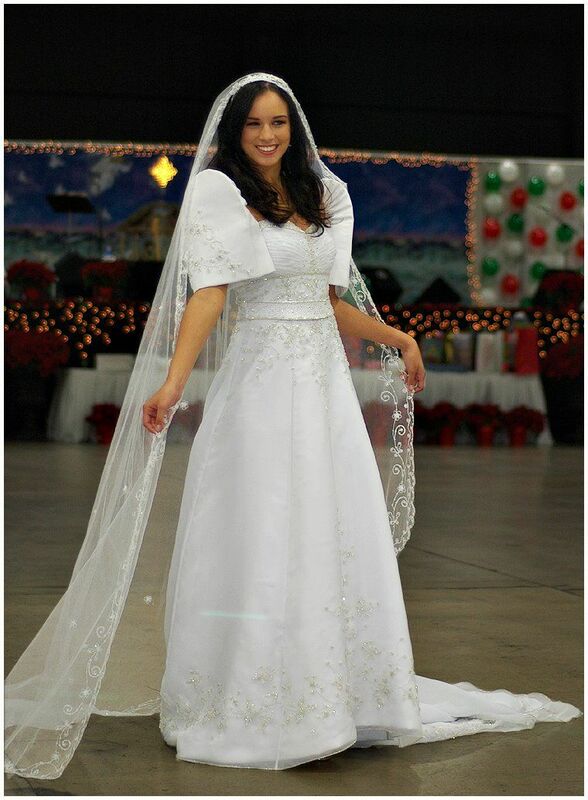 For the bride, a traditional dress is known as a Filipiniana. The dress style has changed slightly over the years, and is slowly bearing more resemblance to a western wedding dress. This Filipiniana may often be two pieces, with its signature butterfly sleeves and exaggerated shoulders. The dress will typically have embroidery and may be in a vibrant and rich color. These dresses are a beautiful part of Filipino tradition. The more westernized and modern version of the Filipiniana will usually be white, with more muted butterfly sleeves and shoulders. Perhaps our favorite moment of Filipino weddings is the money dance, which is sometimes also known as the “dollar dance” or “apron dance”. This tradition has guests line up to dance with the bride and groom on the dance floor. Before dancing with them, the guest will pin money onto their clothing. The money the newlyweds receive is a sign of good fortune. They’ll now have a nice little chunk of change to use towards their honeymoon or journey in life together. This is always one of the most fun moments of the celebration, as the guests really get into it! 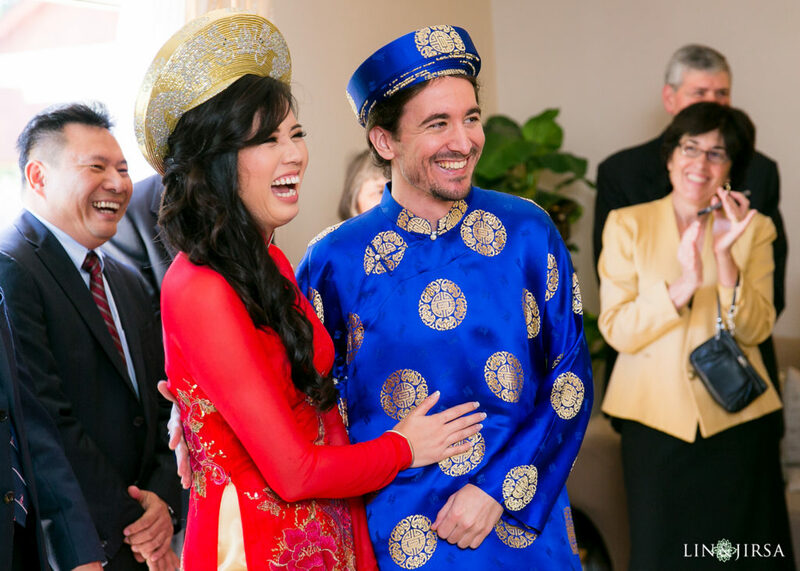 Over the years, we’ve seen Vietnamese weddings slowly incorporate more western culture into their special day while still maintaining a strong sense of tradition. It’s a beautiful blend of historic elements and more contemporary ones. On the day of the wedding, the groom, his family, and close relatives will head to the bride’s home to formally ask the family for their daughter’s hand in marriage. This has similar elements to Armenian weddings, where the groom’s family will bring gifts for the bride. The gifts are stored in red tin baskets called Mâm Qua. Once the gifts are exchanged, the bride will be brought out to see the groom, who will often have a bouquet for her in his hand. They’ll then head over to the alter and begin their ceremony. One of the more emotional elements to Vietnamese wedding is the tea and candle ceremony in which there is a proper meeting of both families. During the ceremony, they will honor their ancestors. To unite their lives, the bride and groom will exchange rings and say their vows before pouring green tea for their family members, starting with the eldest. To celebrate this new union, gifts including money and jewelry will be given to the bride and groom. 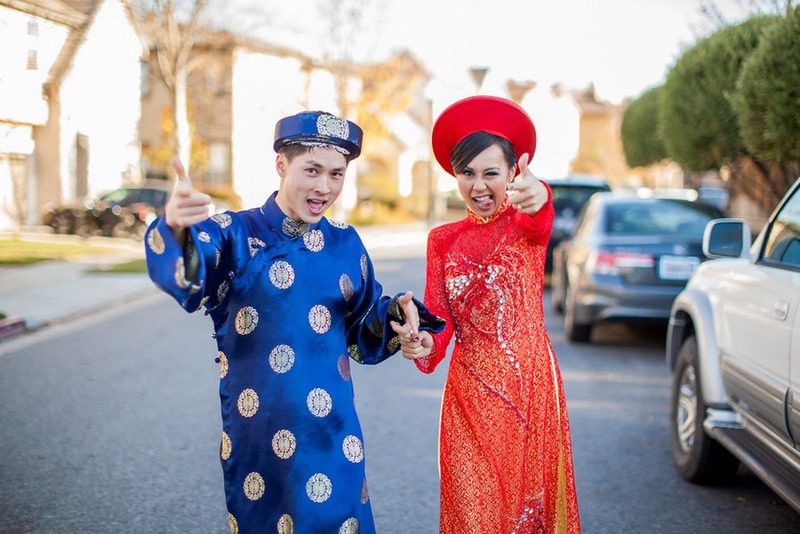 Traditionally for Vietnamese weddings, we see two outfits being worn. The Ao Dai is a two-piece outfit that is worn by the bride and groom. This gorgeous formal dress is embroidered and emblazoned with gold traditional designs. To top it off, the bride and groom will often wear a headdress called a Khan Dong. 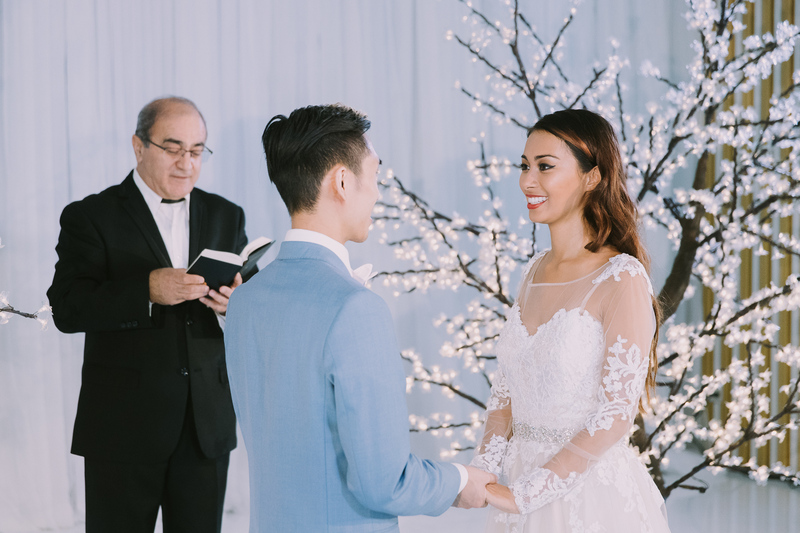 For Vietnamese weddings that have western elements added to it, the bride and groom will often switch to a standard white wedding dress and tuxedo before heading to another ceremony with an officiant. This is typical of Vietnamese-American couples. At Imperial Event Venue, we know how lucky we are to be able experience so many beautiful cultures. The variety of traditions and customs that we’ve learned about and are able to now help celebrate have brought our staff a lot of happiness. To see old traditions still be carried on by couples today warms our hearts and revives our faith in humanity. If you’re interested in hosting your wedding with us, please let us know.